George Logie-Smith OBE passed away peacefully on 19th April at the age of 92. There are notices in the newspapers for more detail. 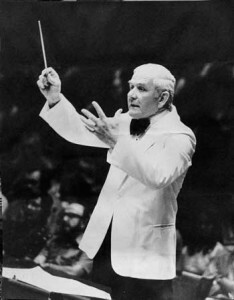 George was the founding Music Director of the Grainger Wind Symphony in 1986. I was appointed the Associate Conductor and was also on the founding committee with Stephen Carpenter, Carol Smitheringale, Bill Brown (dec.), Paul Eagling and others. My sympathies to the whole family. I understand that there will be a memorial service held with details advised soon. (ps. A memorial service was held in Scots Church in the city at 10am on Thursday 7th June 2007). Please pass around this news as there are many people that he influenced and supported and would probably like to know. I worked closely with George as his assistant conductor of the Melbourne Youth Symphonic Band in 1979. At that time, I was also assistant conductor of the Frankston Symphony Orchestra where George was the occasional guest conductor. He was Chief Examiner of HSC Music A for the Victorian Universities Schools Examination Board for a number of years, the equivalent position I now hold for the VCAA. He was the Director of Music at Geelong College, then later at Scotch College where he also coached the first eighteen. As a young student I was a subscription member of the Astra Chamber Society for a number of years where I was greatly impressed by his work as a conductor with a white coat and crooked index finger! George Logie-Smith has been a mentor for my work in music education and as a conductor. His consultancy services provided through the George Logie-Smith Enterprises was very much appreciated. I very much enjoyed his collegial support and celebrate his wonderful contribution to music and music education. I learnt from his judgements and appraisals of music events, politics and developments. I learnt from him what was important in music and understood what was quality music. I understood, through him, what was excellent instrumental technique. I owe him a great deal for what I understand and know about music. People have kindly responded to this tribute to explain how they have experienced and appreciated the wonderful leadership George Logie-Smith provided to their musical lives.